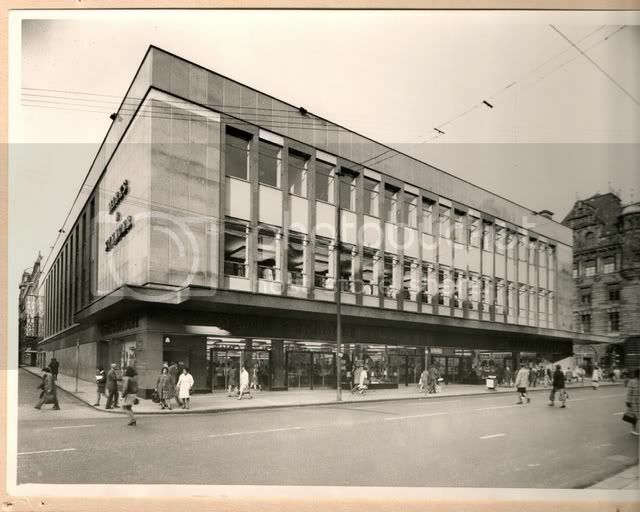 The Hidden Glasgow Forums • View topic - M&S, Mann Byars & Three Historic Glasgow Streets. 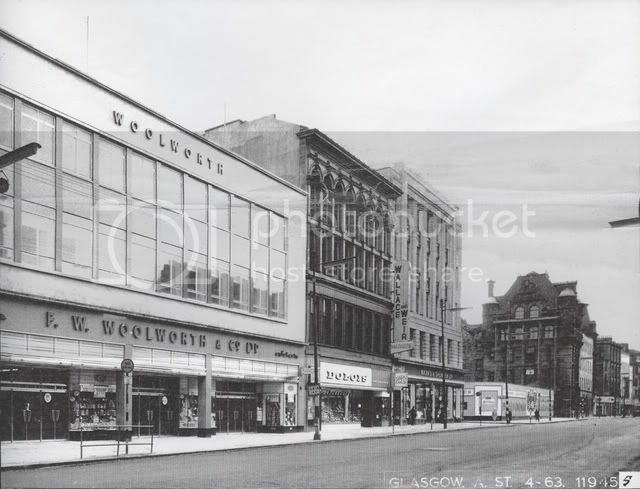 Was without the West Port, and was at first known as Dumbarton Road, then it changed to Wester Gate, and previous to assuming the patronymic of Archibald, Duke of Argyle, it was called Anderston Walk. In May, 1761, the corpse of Argyle, who had met his death in England, lay in state, while en route to the ducal burying-place at Kilmun, in the Black Bull Hotel, then known as the Highland Society's House, in this street, which but a short time previously had been named in his honour. 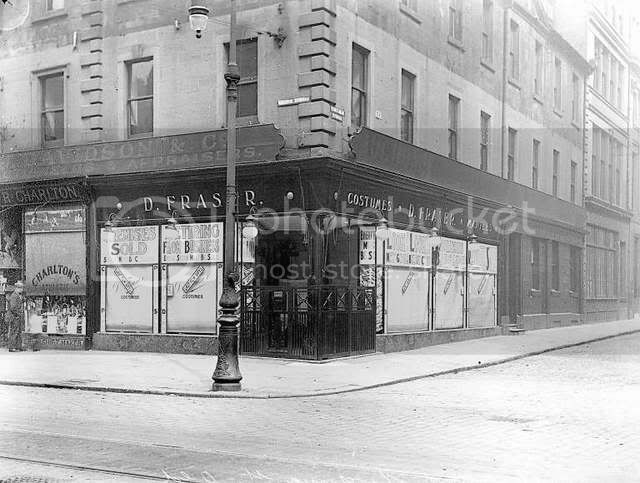 The old hotel still standing between Glassford Street and Virginia Street, is now engrossed in the premises of Mann, Byars, & Co. There were some thirty public, and, perhaps, as many private wells. Some were considered very unsafe, being impregnated with sewage or other deleterious matter, others were held in special repute by connoisseurs. 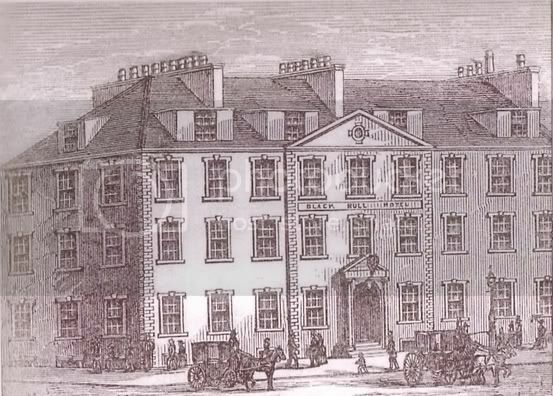 The West Port Well, originally opposite the Anchor Close in Argyle Street, thence removed to the opposite side of the street, beside the Black Bull Hotel, and then to foot of Glassford Street, was one of the most famous of the public wells, and for several hours in the morning the servant-girls were in the habit of waiting their turns till the earlier comers were served. Coaches would also leave from here, heading to Edinburgh, Greenock, Dumbarton and the like. The coachyard at the rear was said to be used by the local urchins to settle disputes by means of fisticuffs. 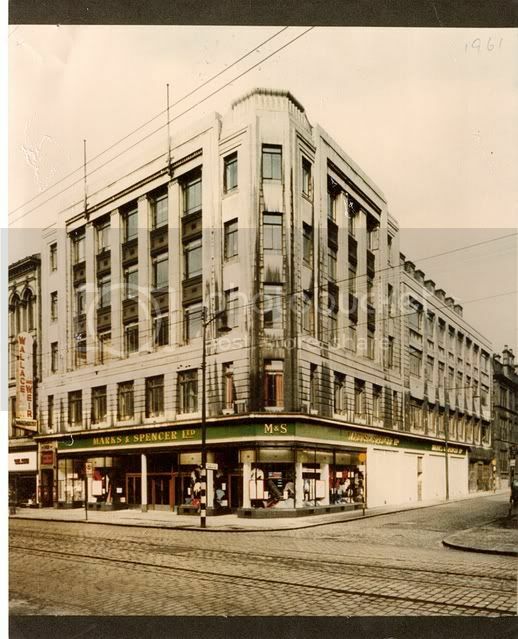 Robert Burns was a frequent visitor to Glasgow and stayed at the Black Bull Hotel in Argyle Street, and it was from here that he wrote love letters to Wilhelmina Alexander, whom he wooed as Clarinda to his Sylvander, and who lived in a house on the east side of George Square. 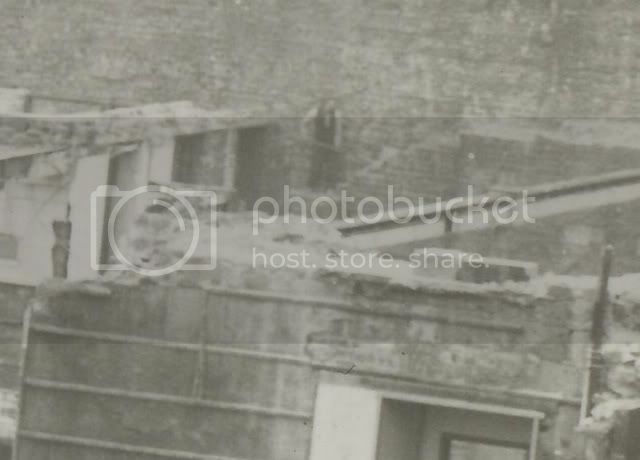 This street got its name in 1753 by Provost Andrew Buchanan of Drumpellier and his son, George, who built the Virginia Mansion which stood at the head of the street, and upon which now stands the Union Bank of Scotland. 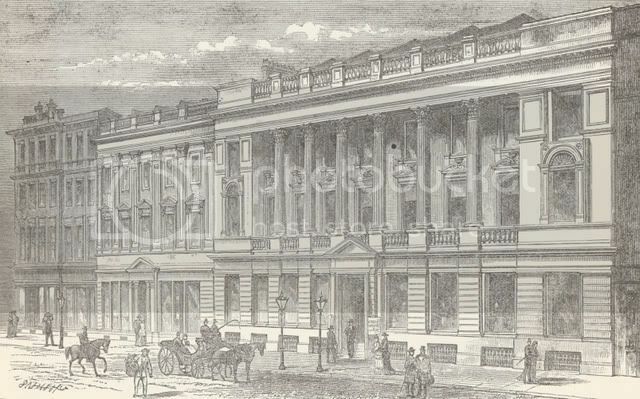 Most of the Virginian tobacco lords had their offices in Virginia Street. 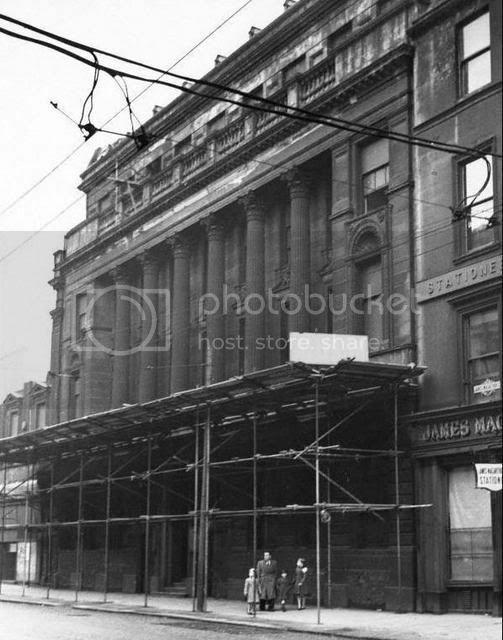 The first house actually built in the street was the Thistle Bank, the City of Glasgow Bank afterwards occupying its site till its failure on 2nd October, 1878. 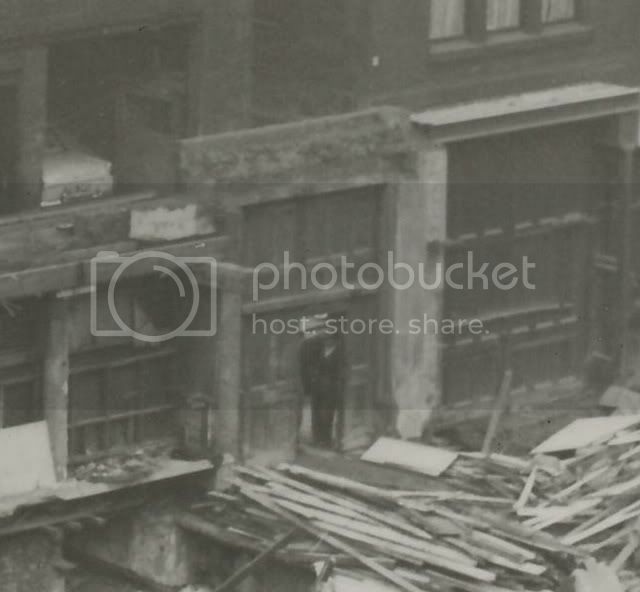 Now it is occupied by Messrs. Mann, Byars & Co., warehousemen. 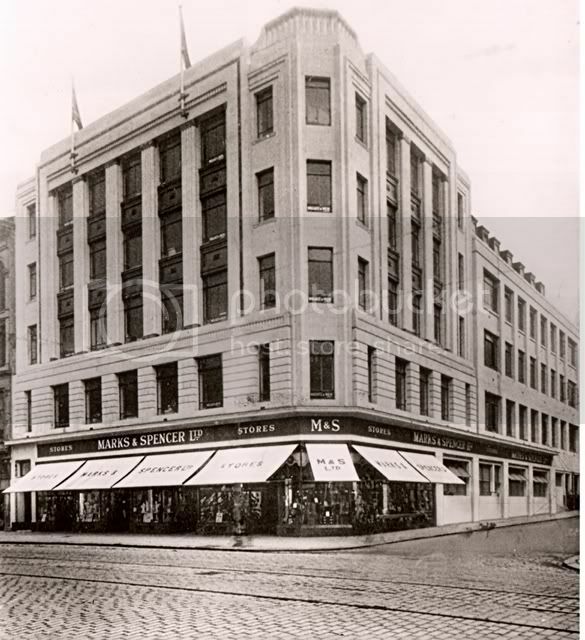 The business of Messrs. Mann, Byars & Co was founded in Glasgow in 1847, and located to its headquarters in Glassford Street around 1850. 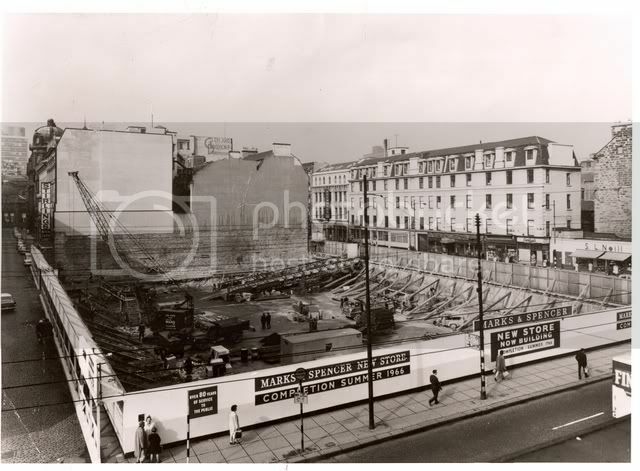 Overtime the property was the subject of numerous extensions and developments, until it covered a very large area of ground, extending from Glassford Street to Virginia Street, and also butting onto Argyle Street with frontages on all of them. 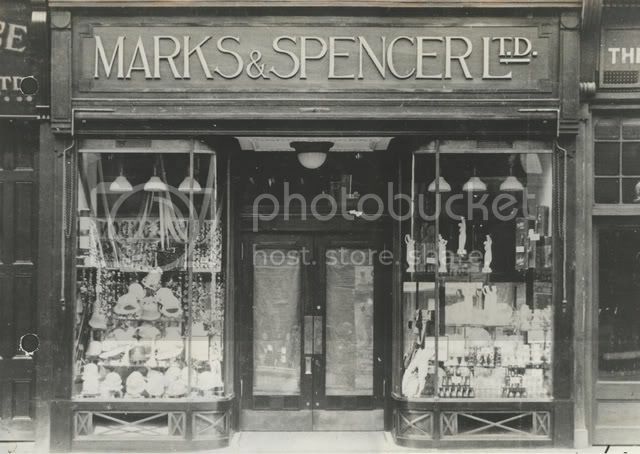 Messrs. Mann, Byars & Co held very large stocks of every line in which they dealt, and were known as both merchants and manufacturers with a hand in almost everything imaginable! 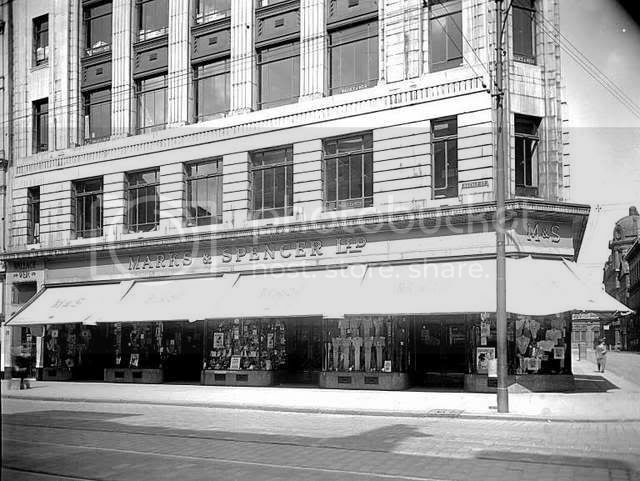 The departments included wholesale flannels, hosiery, cottons, tweeds, linens, umbrellas and boots and shoes to name but a few. 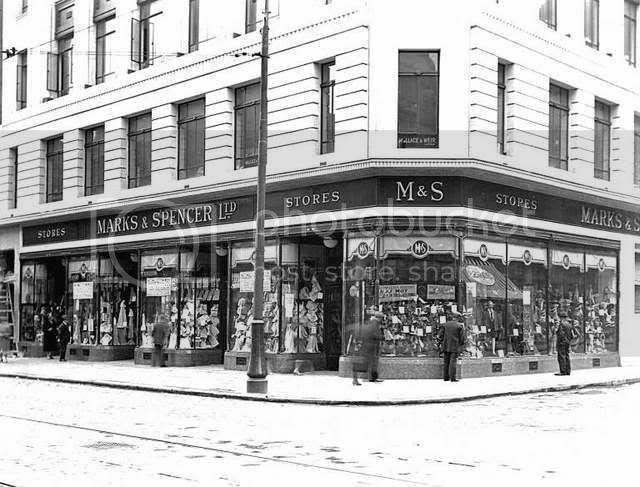 In addittion to the warehouses on Glassford Street, The business of Messrs. Mann, Byars & Co. also controlled an extensive factory, opposite the headquarters with the entrance onto Virginia Street. Here, they produced a massive range of goods, manufactured by the 400 strong workforce. 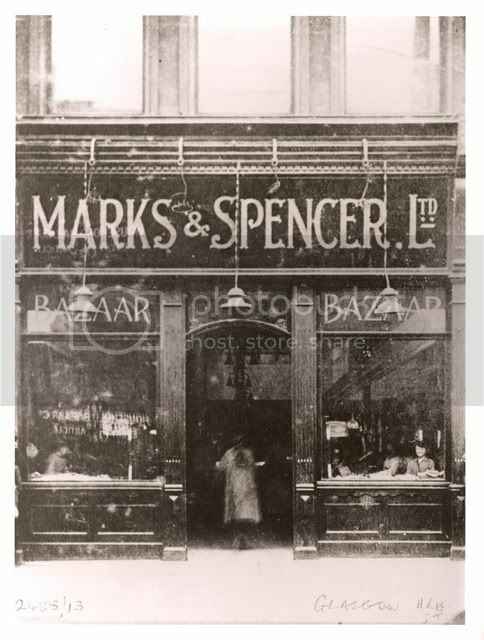 The entire business of Messrs. Mann, Byars & Co. helped provide much of the city's wealth, and employed a total of 1300 staff. The work done there was considered to be of the highest quality with nothing allowed to leave the factory for the warehouse without first passing a full examination at the hands of a trained inspector. 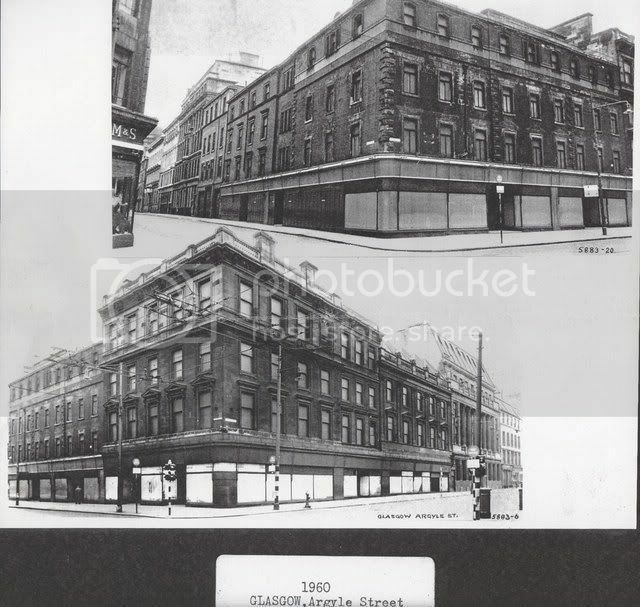 Stewart & Macdonald of course can be seen holding up the stone canopy on the building of the same name next to Frasers further along Argyle St. Opened 1793, is formed on the site of Henry Glassford of Dougalston's garden. The Shawfield Mansion was its southern boundary, the eastern wing of which is still there, though considerably altered; and the writer remembers seeing, previous to the last alteration, the hooks in the wall whereon had hung the old garden gate. Since the foregoing was written, the remaining remnant of the old mansion has been swept away, the site having been acquired for a bank. 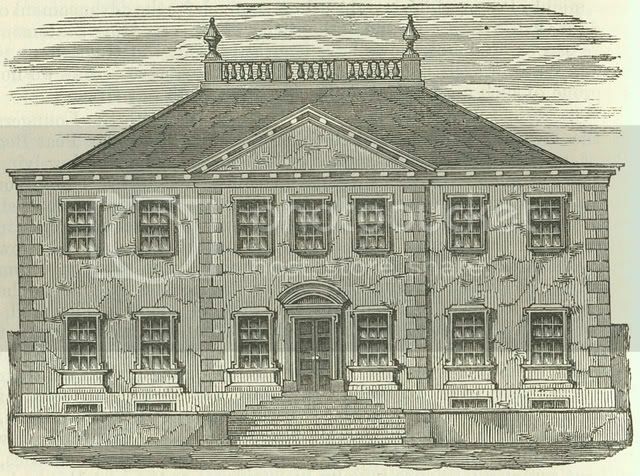 The Shawfield Mansion was built by Daniel Campbell of Shawfield in 1711 and stood at the foot of Glassford Street. A central staircase served the four apartments on the first floor and the front was decorated with a doric cornice and balustrade. In 1725 the mansion was the scene of an infamous riot. Many Glaswegians blamed Campbell (the MP for the Clyde Burghs, 1715-1734) for the passing of an Act of Parliament imposing a 2d (less than 1p) tax on Scottish malt. Fearing the worst, Campbell packed up his valuables and fled the city with his family. 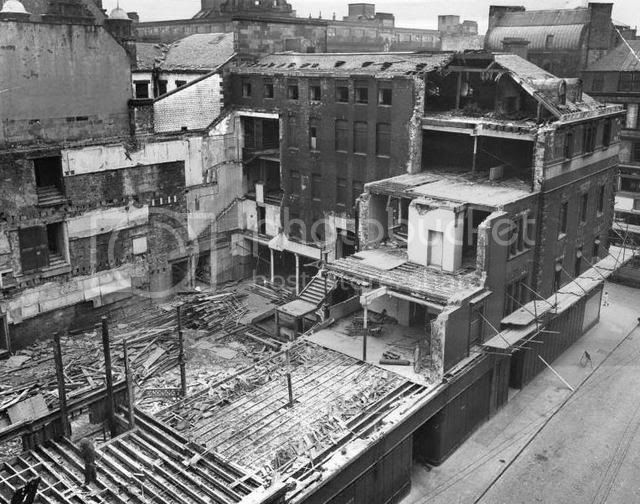 On the night of 24 June, the day after the passing of the Act, rioting Glaswegians sacked the mansion. On 25 June, in further rioting, several people were killed and wounded by soldiers who had been sent to the city to help preserve law and order. Prince Charles Edward Stuart stayed in the mansion between December 1745 and January 1746. The prince is said to have met his mistress Clementina Walkinshaw (1726?-1802) there. 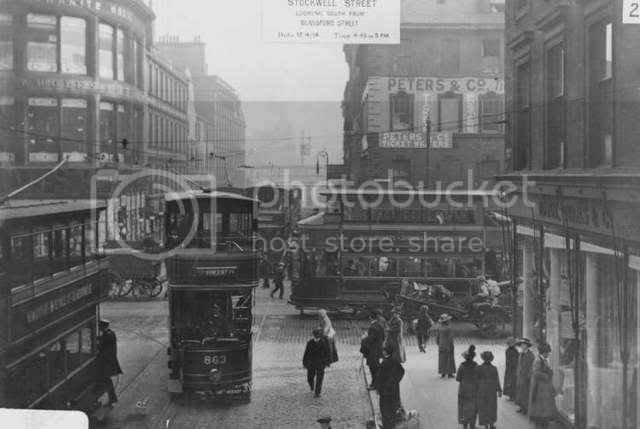 Stockwell Street, 1914, looking south from Glassford Street across Argyle Street. 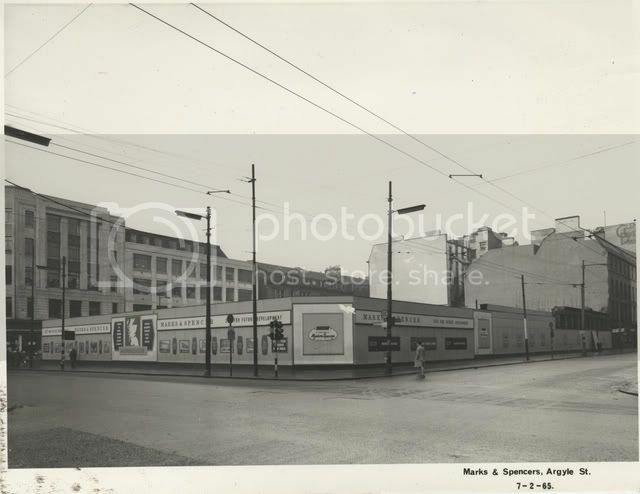 Mann Byers' department store is on the right of the picture and Granite House is on the other side of Argyle Street, on the left. 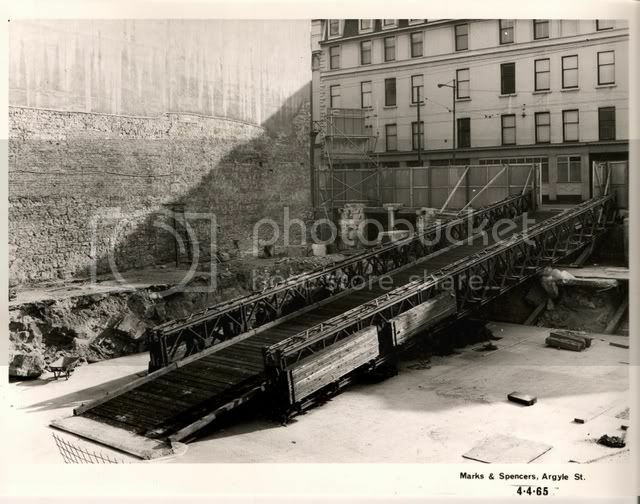 The photo is one of a series taken by Glasgow Corporation Tramways. 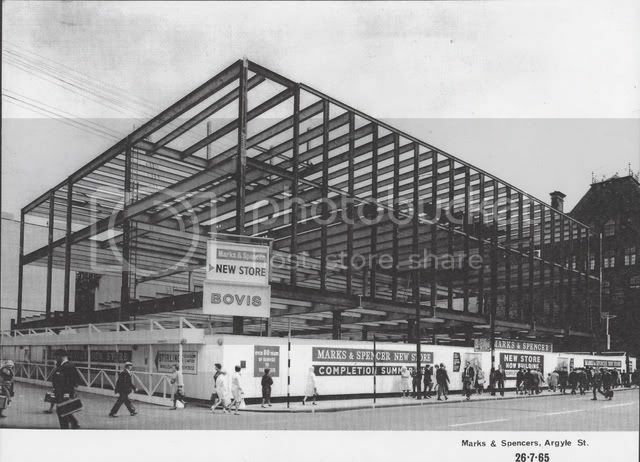 This undated photo from the Virtual Mitchell shows the site, lying between Virginia St & what was until recently 'The Argyle Market', that became Marks & Spencer until the construction of the new building that replaced Mann Byars. 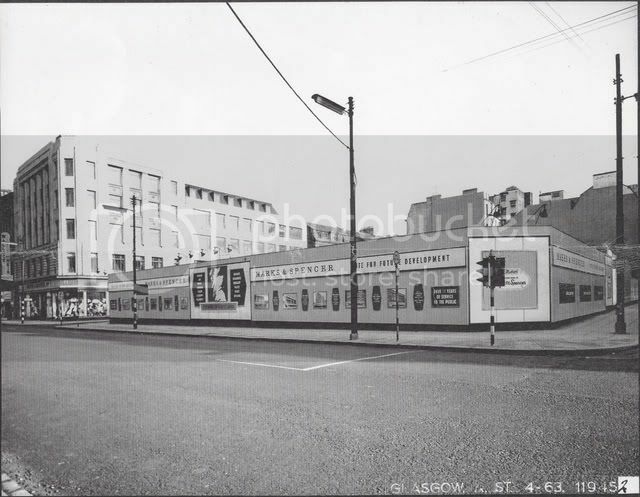 The title states only 'Glasgow Argyle' Probably the shop that replaced the one above. 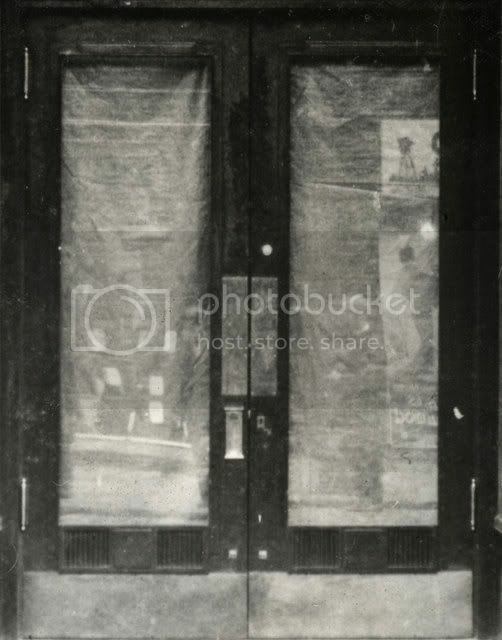 Note the little girl in the doorway. 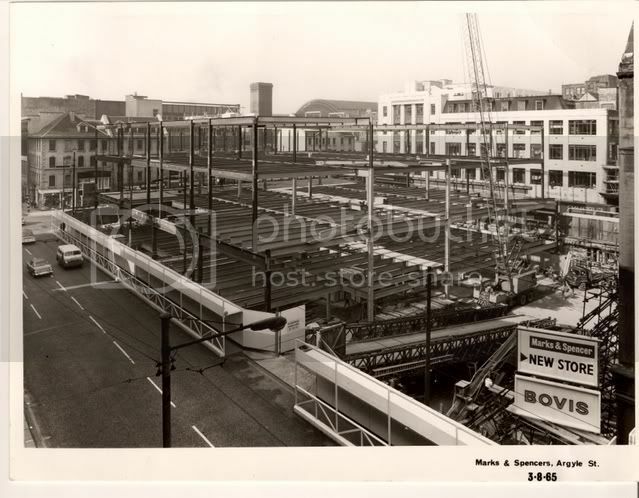 Note the Mann Byars building has been demolished to make way for the construction of the new Marks & Spencer. Excellent bit of research there HH. Well done. Interesting read. Thanks. 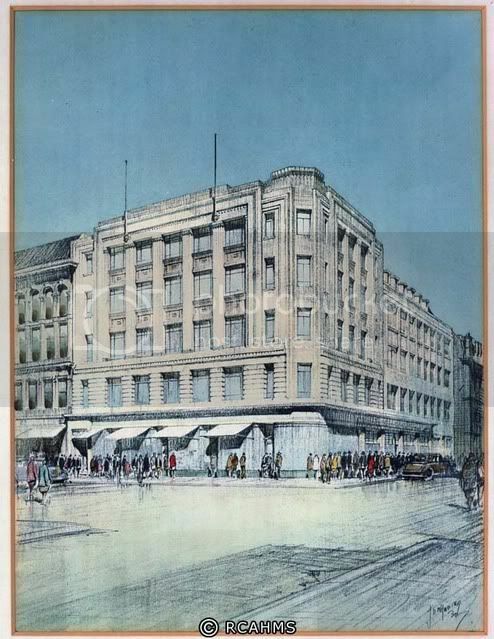 Re: M&S, Mann Byars & Three Historic Glasgow Streets. Here are some views from Argyle St. 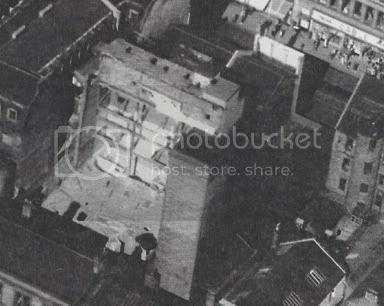 This photo is dated 1960 but I can't reconcile this with the above two photos showing the buildings well into their demolition. 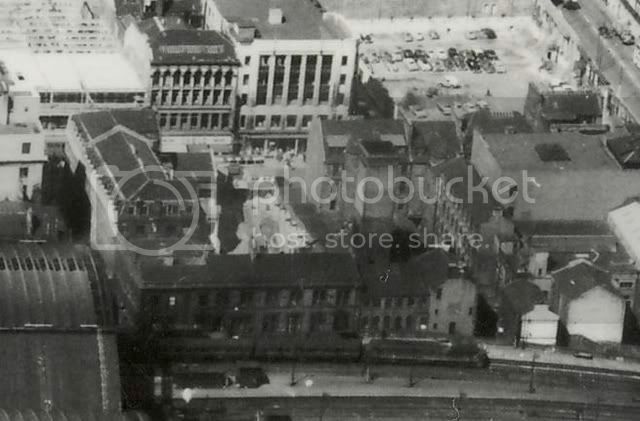 The first one (Virginia St./ Argyle St) I could accept but the second clearly shows Glassford St. intact. 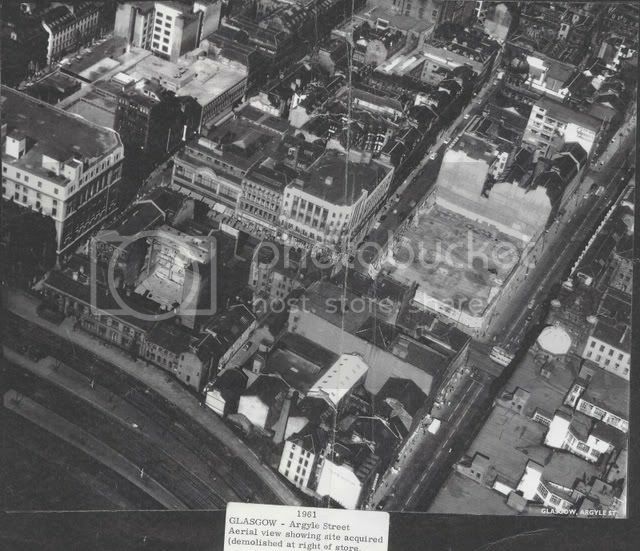 Note the Virginia Galleries & the platforms of St. Enoch Station. 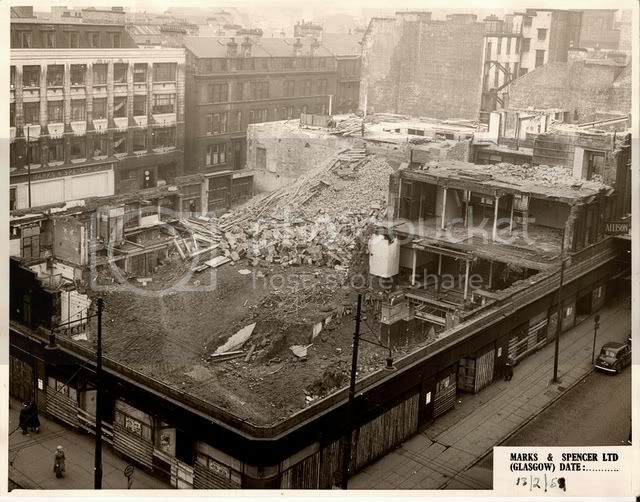 The building being demolished in the foreground appears to be the auditorium of the Argyle Electric cinema, which closed in 1960 (and exactly where the (Argyle St.) station is now). 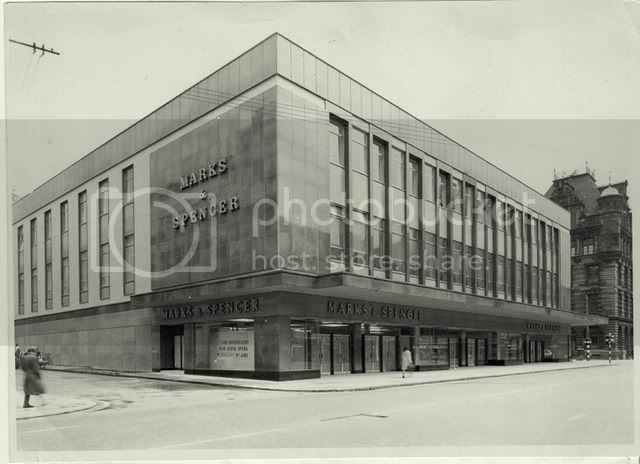 The white rectangular bit facing Argyle St was its entrance facade. 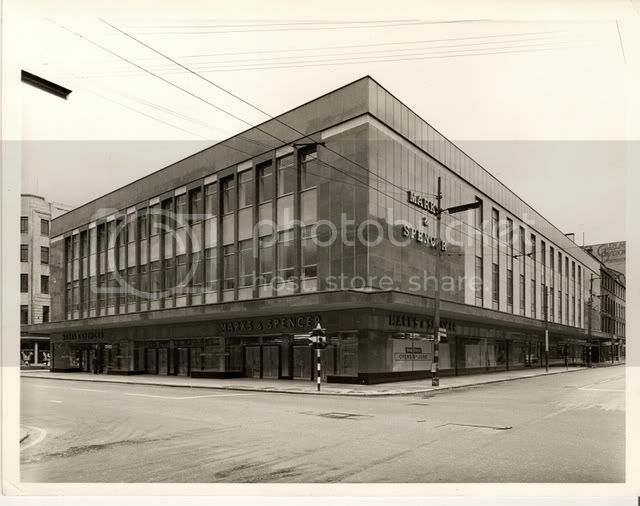 Here is a pic from Nodrog showing the same area a little later, the demolition site is now being used as a car park. Note the train leaving St. Enochs.